In conjunction with National Drug Take-Back Day, Lee's Summit CARES and the Lee's Summit Police Department have partnered to provide a safe, convenient, and responsible means to dispose of unused prescription and over-the-counter medications. 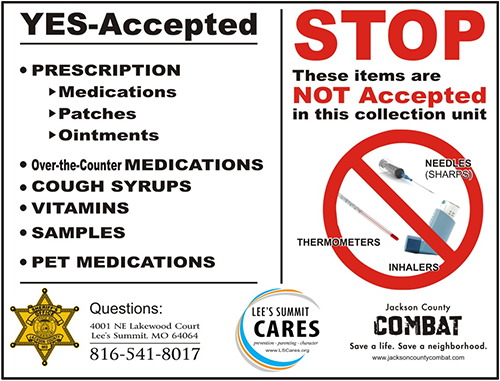 Persons can turn in unwanted and expired medications at one of the several drop off locations throughout Lee's Summit. Medications can be accepted in the original bottles, no need to remove labels. Needles and inhalers are NOT accepted. At each of these locations representatives from the Lee’s Summit Police Department will be on hand to accept the medications and answer questions.